Protesters are plotting disruption at U2's long-awaited headline gig at Glastonbury. The Irish rockers are expected to face a "visual spectacular" from campaigners angry at the group's alleged "tax dodge" in Ireland. With heavy rain forecast, the 170,000-strong crowd will continue to party in a 900-acre mud bath as the main acts get under way. But Bono and his bandmates could have more than the quagmire to worry about. Direct action group Art Uncut is planning to unfurl a giant inflatable before the BBC cameras as the "world's biggest band" take to the Pyramid Stage. Campaign member Anna Walker, 32, said: "Everyone there will see it. If the BBC do not broadcast it, there is little doubt that it will have been an editorial decision." Placards will also be held up declaring "Bono tax dodger" and "Bono pay up". Fellow campaigner Charlie Dewar said: "U2's multimillion-euro tax dodge is depriving the Irish people at a time when they desperately need income to offset the Irish government's savage austerity programme. "Tax nestling in the band's bank account should be helping to keep open the hospitals, schools and libraries that are closing all over Ireland. 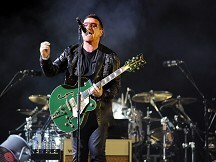 Bono is well known for his anti-poverty campaigning but Art Uncut is accusing him of hypocrisy." U2 fan Sarah Craig, 42, from Gloucester, said the band's loyal fans could intervene. She added: "I don't think the protest will go down well. I for one will be giving them a headache if they plan any protest in front of me." Morrissey and Primal Scream also feature on the bill. A scuffle outside a Macy's store where teenage singing star Justin Bieber was attending a promotional event was described by his representative as "a misunderstanding". Bono has revealed his frustration at cancelling last year's Glastonbury performance by releasing a video filmed in his hospital bed. Muddy mayhem reigns again at Glastonbury with torrential downpours expected to sweep across the 900-acre site. George Michael is staging a special gig to raise money for an Aids charity fund in memory of screen star Elizabeth Taylor. American singing star Glen Campbell is suffering from Alzheimer's disease.The 75-year-old and his wife Kim revealed the singer's condition in People magazine in the US. Sean Kingston is out of the hospital, almost a month after crashing his watercraft into a Miami Beach bridge.